Roll up, roll up! Sideshow Slots has rolled into town and, with Mr Spin as your ringmaster, it really is the greatest online slots show around. If you’ve always dreamed of running away with the circus, now’s your chance! Have you got what it takes to pull a win out of the hat? Locked to 15 win lines, Sideshow Slots is seriously in-tents fun thanks to the multiplier mini-game and not one but two fabulous free spin features. And with the huge progressive Mega Jackpot up for grabs too, this is one mobile slots game sure to put a smile on your face. Join our ringmaster today, and see if you can make it in the circus. Sideshow Slots is compatible with iOS 10 and Android 5 and above. The tent is ready and the stage is set…are you ready for some Sideshow Slots action? You won’t need to learn to juggle or tame a lion to get started playing this mobile slots game; all you’ll need is your smart phone or tablet! Select “Play for Real” from the main menu and you’re ready to go! The first trick you’ll need to master though, is setting your bet-per-line – but don’t worry, that’s trapeazy! Tap ‘Bet’ and use the ‘+’ and ‘-‘ to increase or decrease your bet amount. Sideshow Slots is fixed to 15 win lines, so this figure will be multiplied by 15 with the cost-per-spin displayed in the ‘Total Bet’ box. For instance if you bet 10p a line, your total bet will be £1.50 and so on. You can bet anything from 1p to a maximum of £5 a line. Happy with your bet? Press the white arrow to start the reels a-spinning! You might need both hands to really show off at this circus though, which is why Mr Spin has included an Auto Spin feature. To activate this, tap ‘Bet’ and select ‘Auto Spin’ to choose your number of auto spins, credit limit, and maximum win amount. When you’ve set Auto Spin parameters you’re comfortable with, tap the arrow and the reels will start to spin in on their own. They really are the star of this mobile slots show. The Auto Spins will end either when you run out of spins or hit one of the limits you set. You can tap ‘Stop’ to revert back to manual play at any time. We’ve got a ringmaster, we’ve got circus acts, and we’ve got YOU! 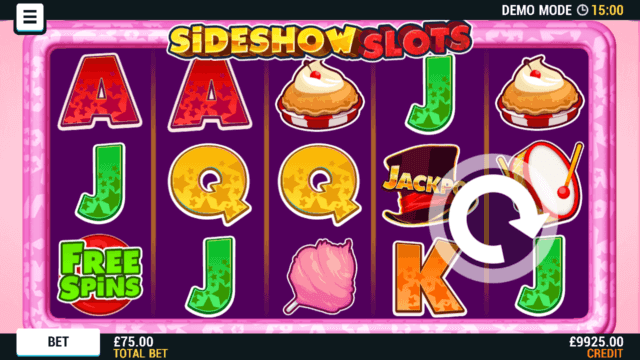 It’s time to get Sideshow Slots underway, so set your bet-per-line, tap the floating arrow and watch those reels spin. The symbols will spin in and stop at random. Much like a tightrope walker, our win lines are easy to follow and just as exciting to watch. In case you were wondering, the ones in this Mr Spin mobile slots exclusive always pay from left to right. Any winning lines will be highlighted on screen before the win amount is added to your credit. Spinning in a win at this mobile slots circus is all about lining up a specific combination of symbols on any of the 15 win lines in play. Just how many you need to line up depends on the symbol. With some, you’ll need two or more whereas you’ll need a minimum of three to score a win with others. You can find full details by tapping the three lines in the top left and selecting ‘Paytable’. When the show begins, there’ll be real excitement in the air, especially when you line up a winning combination of Sideshow Slots symbols. Each of these combinations award you a different multiplier of your original bet-per-line and could see you put on the performance of a lifetime. The crowd will be “Oooh”-ing and “Ahhh”ing if you spin in a winning combination across more than one win line, as these will be added together to make up your total win. We hope you won’t boo us off when we say this, but only the highest win-per-line will be paid. If you’re seeing stars on the Sideshow Slots win lines – and you haven’t just been fired out of a cannon! – don’t worry, it’s probably the blue Wild symbol. Wilds are a pretty handy symbol to spot so if they roll up and line up on your win lines, you could see a losing spin become a winning one. Wild symbols will substitute for most other symbols in the game except for the mini-game, Free Spins, and Re-Spin symbols. Here’s how it works. If you line up two cannons and a Wild, the Wild will act as a cannon and you’ll win the multiplier for 3 x cannon symbols. Ain’t that a blast?! Now don’t throw a custard pie in our faces, but you can’t win the progressive Mega Jackpot if a Wild lines up alongside 4 Jackpot symbols. You’ll bag a mega win of course, but you need 5 Jackpot top hats to win the main prize. Speaking of custard pies being thrown in faces, you might want to keep an eye on the reels for the pie symbol. If you spin in three or more of these mini-game symbols anywhere on the reels, you’ll enter the Pie Spinner mini-game. There’s no time for clowning around in Pie Spinner as there are three pies – and mega multipliers – to choose from. Each pie wheel has its own multiplier but choose carefully, as those with the biggest multipliers are harder to win. When you’ve made your choice, the pie wheel will spin automatically. If it lands on a white section, you win the multiplier and can proceed to pick another wheel – you can play up to 10. Piefect! Land on a red segment though, and that’s the end of Pie Spinner. You’ll collect all the multipliers you’ve won so far and return to the main Sideshow Slots reels. Mr Spin relishes his role as ringmaster – it must be that snazzy top hat – so keep an eye out for his special RingMaster Re-Spins symbol. Spin in three of these purple symbols anywhere on the reels and you’ll bag yourself a re-spin! Here, the reels will re-spin automatically at your last bet-per-line value – with our ringmaster paying for this one! – giving you another chance to bag a win. Once the re-spin has ended, and any wins have gone into to your credit, Sideshow Slots is back in your control. The ringmaster’s generosity doesn’t end there, as you could grab yourself up to 20 free spins if you get a scatter of Free Spins symbols. If you spin in 3, 4, or 5 red and green free spins symbols anywhere on the reels, you’ll receive 10, 15, or 20 respective free spins. These free spins will lock at the bet-per-line of your last paid-for spin but as Mr Spin is footing the bill, your credit won’t take a hit. What are you waiting for? Download Sideshow Slots today and see why everyone is running away to the circus. Not got a Mr Spin account yet? Register for your first and only account today, and grab a welcome bonus of up to 50 FREE SPINS* with no deposit required! Mr Spin also offers 100% deposit match up to £100 on your very first deposit! * Join today, and take Sideshow Slots for a spin. Sideshow Slots return is 94.8% based on the best player strategy (selecting the wheel with the lowest prize in the Pie Spinner mini-game). This means if you always choose the wheel with the highest prize, you would expect the return to be 87.3%. This is based on long term playback. System malfunctions void all payments. Monies are staked in the following order: winnings, player deposits, bonus credit.